Guess how much banks made on overdraft fees in 2015? $11 billion. Stunning. That’s 8% of their profits. How motivated do you think that makes banks to help customers avoid overdraft fees? Not at all. In fact, quite the opposite. Banks have been fined more than $1.1 billion for deceptive overdraft practices. 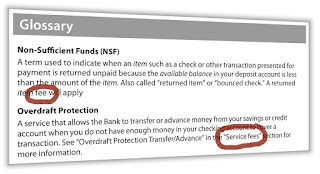 Sneaky stuff like obscure overdraft protection language and reordering your purchases to maximize the number of overdraft fees they can charge. Shameful. Guess who bears the brunt of the overdraft fees? Customers with low balances. Like low income customers. Like your teen. The banks are playing a lucrative game. It’s called Hide-The-Bank-Fee. So, before your teen starts using that first bank account, play your own game: Bank Fee Bingo. Make your teen circle all the fees on the account agreement. Discuss each one. Don’t be surprised if locating and understanding all the fees is harder than you thought! When your teen can find every fee and explain when it applies, she’s ready to level up and beat the banks at their own game.